"The assassination group will embark at once in our time machine. They pursue the humans through all eternity. They must be destroyed! Exterminate them! Exterminate! Exterminate! Exterminate!" The Doctor is finishing work on the Space Time Visualiser as the other try to relax. 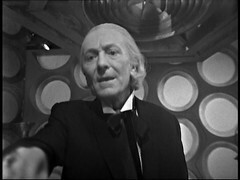 It will allow them to visualise any event in history as the Doctor demonstrates. 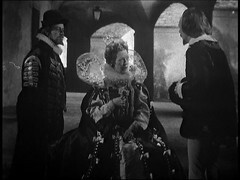 Ian gets the Doctor to show him the Gettysburg Address, while Barbara sees Queen Elizabeth talking with William Shakespeare and him gaining the inspiration for Hamlet. Vicki sees a performance by the Beatles singing A Ticket To Ride saying she didn't realise they did classical music while Ian does his best Science Teacher At A Sixth Form Disco. 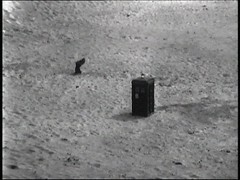 The Tardis materialises in a sandy desert surrounding but Vicki fails to properly turn off the Time Space Visualiser. Outside of the ship two suns bake the landscape. Vicki & Ian explore, as a tentacle reaches out the sand. The Doctor & Barbara are sunbathing when they're interrupted by the Visualiser making a noise. 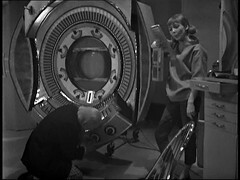 Barbara goes to turn it off but finds it showing a transmission from the Daleks' control room. 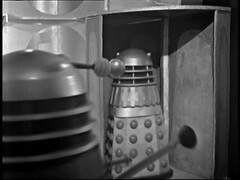 The Black Dalek machine dispatches a squad of Daleks in their own Time Machine to track the Tardis. Knowing this the Doctor & Barbara go to find Ian & Vicki who are still wandering the sandy landscape dotted with odd sculpture. As night falls Ian finds a metal ring in the sand which when he pulls it opens a trap door into an underground passageway. The Doctor & Barbara are searching for them without luck but have got themselves lost. Another tentacle seals Ian & Vicki in the passageway as they are stalked by the strange beast that it's a part of. 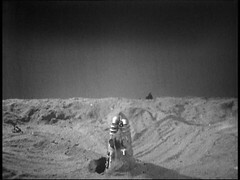 The Doctor & Barbara are trapped overnight in a sandstorm which has buried the Tardis which they now cannot find. 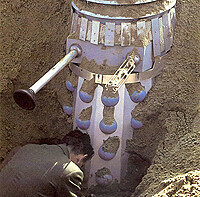 As they look there is a disturbance in the sand as a Dalek rises from it. After the last four episodes that was manna from heaven. Not the most complicated or sophisticated episode of Doctor who but it made sense and worked OK. 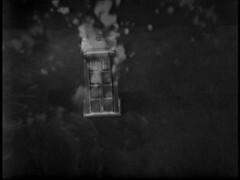 The episode opens with a shot of the Tardis travelling through space which I think is the first time we've seen that! We'll see most of the actors involved here again: In these Robert Marsden appears as Abraham Lincoln - He's back as a prisoner in Mind of Evil episode 3 and a UNIT soldier in episode 4 of the same story. 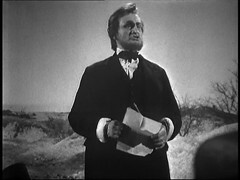 Roger Hammond, who plays Francis Bacon here, returns as Doctor Runciman in Mawdryn Undead while Hugh Walters, William Shakespeare, is also in The Deadly Assassin as Runcible and Revelation of the Daleks as Vogel. Only Vivienne Bennett as Queen Elizabeth I fails to make a return appearance but Queen Elizabeth and Shakespeare reappear in the 10th Doctor story The Shakespeare Code where they're played by Angela Pleasence & Dean Lennox Kelly respectively. Elizabeth then returns, apparently marrying the 10th Doctor, in the anniversary story The Day of the Doctor where she's played by Gavin & Stacy's Joanna Page. And then up pop The Beatles in it! 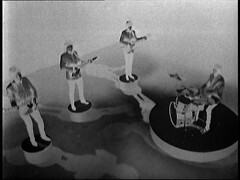 The clip used in the episode was originally from is from the 15th April 1965 episode of Top of the Pops which has now been lost. 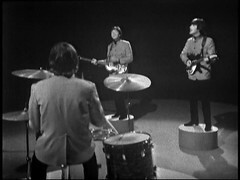 This is believed to be the only surviving clip of The Beatles performing on the program. Unfortunately it's inclusion prevented the story from being released on DVD for a while but a new rights agreement in the UK has allowed this to be released, though I'm led to believe that the American version of the DVD has this scene cut! This all soaks up ten minutes of the episode before we get to the most important thing in the episode: The Daleks are back! Since their last appearance in Dalek Invasion of Earth they've had a redesign, glimpsed in the closing moments of the Space Musuem. Gone are the enlarged bases and the dish on the back of the Dalek while the eye balls have reverted to the black used in the first story. Added around the upper ring on the shoulder section we now have a layer of wire mesh and a number of upright slats obscuring the ring. This feature is present on all future Dalek appearances and they're referred to as Power Slats, taken as the reason for the Daleks' increased mobility. The black Dalek Supreme is seen again in this episode, and like his Dalek Invasion of Earth appearance he's the prop using the broken & repaired neck ring section. For more details see Dalek 6388's The Chase Page. 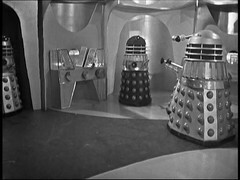 We see six Daleks enter the time machine achieved by having the three silver painted props entering the time machine, going through the back off to the right of the screen and entering the time machine again! 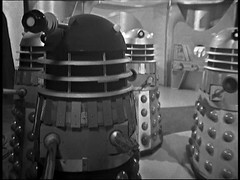 Unfortunately the effect is spoilt a little by the middle Dalek in each group of three still having a silver eye from Dalek Invasion of Earth: this is the same prop used in the previous story The Space Museum. There may be more than the six Daleks inside so we'll keep track of them over the next few episodes. With the Daleks come the usual suspects from the first two stories: Peter Hawkins & David Graham as the Dalek voices with Robert Jewell, Kevin Manser & Gerald Taylor as the Dalek operators who are joined for the first time by John Scott Martin who was previously a Zarbi in director Richard Martin's previous story The Web Planet. I'm not sure the attempt to recreate Dalek Invasion of Earth's shock ending works too well.... we've already seen the Daleks twice in the episode anyway! 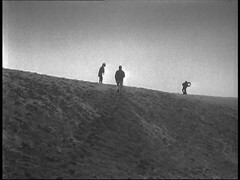 However the model shot we see on screen wasn't the original plan: they were going to attempt to physically pull a Dalek out the sand while filming on location at Camber Sands. However that didn't work too well so they were forced to resort to the model shot. Material from Camber Sands does make it into the episode, but with long shot doubles for the series regulars. It's the first time that location filming doubles for an alien planet!